Posted by Sara MacLennan on Thursday, March 12th, 2015 at 2:23pm. The new Red Bull Crashed Ice course has recently been completed, and it is one of the longest and wildest courses on the circuit this year. The track measures 415 meters in length, and it has a total vertical drop of 45 meters. There are a total of nine turns, and the top speed that competitors can reach while cruising down this course is 55 kilometers per hour. The course begins at the top of the roof at the Shaw Conference Centre and takes competitors down a steep slope that equates to approximately six floors of a building. The course then crosses Grierson Hill Road bridge. Altogether, the course features 23,625 square feet of artificial ice. This is truly one of the top tracks built for this year's events. 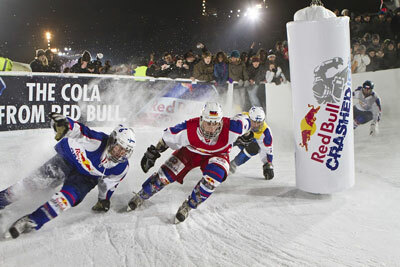 The Red Bull Crashed Ice series brings competitors to various locations on several continents to compete in head to head action, and each competitor will accumulate points that accrue and elevate their status in the standings. Some of the top contenders for this year's event are Scott Croxall, Dean Moriarity, Kyle Croxall, Marco Dallago and Cameron Naasz. These competitors will all be attending the Edmonton event, and others like Michal Urban, Paavo Klintrup, Jim De Paoli and others will also attend. The Red Bull Crashed Ice event in Edmonton is a free event, and all ages are invited to attend and cheer on their favorite competitors. If you are planning to attend, you will want to arrive early to find the best spot to watch the event. Viewing areas include those in Louise McKinney Park, at the Shaw Conference Centre and on Grierson Hill Road. There are also large projection screens set up in Sir Winston Churchill Square and on Jasper Avenue that provide additional viewing opportunities. When selecting your viewing location, pay attention to the steepness of the course, the turns and other course variations to ensure that you make the best decision about where to view the top action on the course. The Red Bull Crashed Ice event will be televised on Fox Sports 1, Red Bull TV and on a live stream on the event's main website. While you could sit back and watch the event play out on television, you will have a better experience when you make plans to head out to the Shaw Conference Centre and see the action live and in person. This free event is open to the public, and you simply have to show up early to get a great spot in the stands.